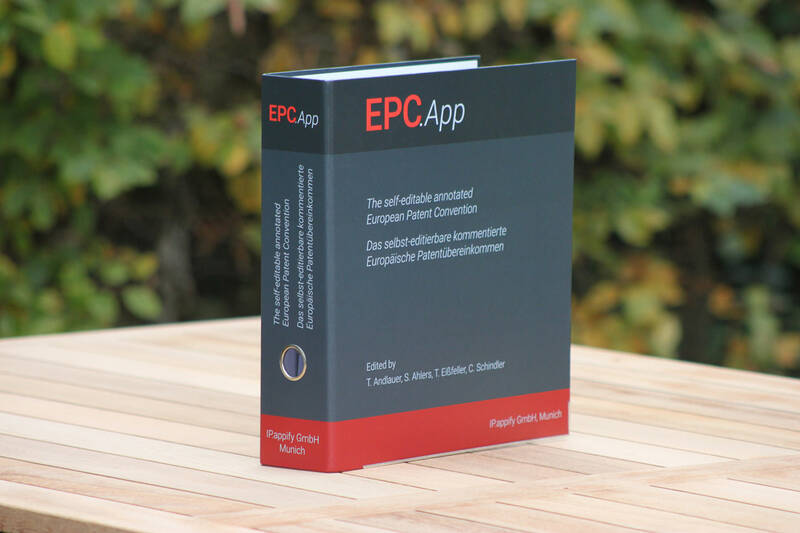 EPC.App is an annotated European Patent Convention (EPC), which allows each user to further annotate it electronically and to receive updates from the authors without losing individual user annotations. EPC.App is available in English and in German (with same content) and encompasses the Articles, Rules, Protocols of the EPC, as well as the Rules relating to Fees, Examination Guidelines, Official Journal articles, case law, etc. The PDF-file makes up more than 600 A4 pages with default settings already without personal user annotations. For whom is the EPC.App? EPC.App is intended for both the Practitioner and the Trainee. It is dedicated to be used when preparing for the European Qualifying Examination (EQE) and for working as a Professional thereafter. If you are interested in the displayed folder (as long as stocks last), please send an e-mail to support@ipappify.de. For all those who prefer to start with a classical book, a printed version of EPC.App (April 2019 Edition) with all authors' annotations can also be ordered as paperback on Amazon (www.amazon.co.uk or in your local marketplace). This version has US-letter format (2.6cm thick), our default color layout, and an additonal edge index for different parts of the EPC, which is visible on the closed book's edge. We now updated the content of the EPC.App to legal status of 1st April 2019 and also included all valuable feedback from our EQE users. For more detailed information, please refer to the FAQ. In the App, all changes are explained by blue update notes and you can conveniently jump through the electronic book from one change to the other using the notes assistant. The update notes can also be exported to the PDF to track amended pages and minimize printing effort for replacements. EPC.App provides new options of adapting the book layout to your personal preferences. After login, under "Settings", the marking styles (e.g. underline, highlight, bold, ...) can now be changed per marking category, and then consistently affect all markings of the changed type throughout the book, both in the Web browser view and in the generated PDF. New PDF generation options for optimizing the PDF either for printout as a loose-leaf collection or for electronic reading / creating a bound printed book. 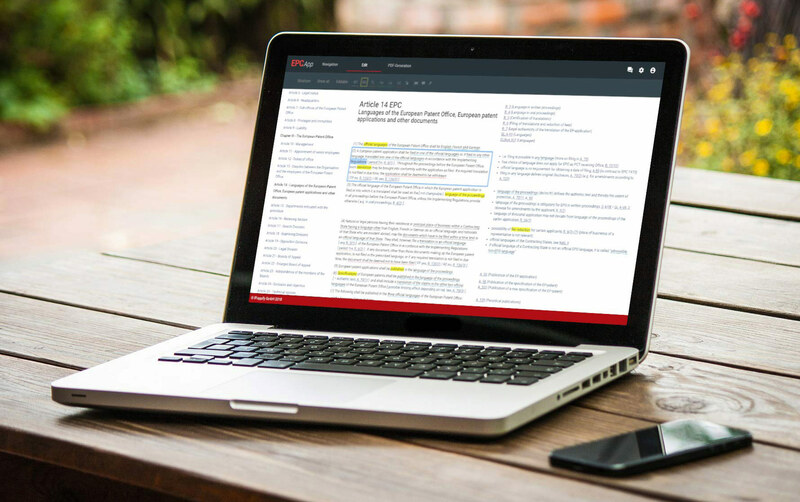 Depending on the setting, the total number of pages in the PDF can be reduced by more than 250 without removing any real content of the book. Completion of pre-release test phase and official start of usage for everybody with updated legal status (1st November 2018, usable for EQE 2019). As of now, users can purchase permanent licenses after signing in to the EPC.App user area. As of now, you can register for a free test account valid until 31.10.2018, which allows to read the entire content and to test editing functions. Candidates preparing for the European Qualifying Examination 2019 may now receive a printable complete PDF with all authors' comments free of charge for personal use. Further information can be found on the Prices page.